I don't really talk about my disability very much, but October 1st is World Cerebral Palsy Day and October is Disability Awareness Month, so I'm going to address some disability-related issues all month long. Don't panic; I'm still going to write about fashion, and I'm going to link-up like crazy. In return, I ask that you indulge me by reading what I have to say (even though I know sometimes I don't get to reciprocate), sharing copiously, and commenting thoughtfully. I am one of 17 million people worldwide born with Cerebral Palsy. One in two people with CP live in chronic pain; one in three can't walk; one in five can't talk; one in twenty-five have a severe hearing impairment; one in ten have a severe vision impairment. The number of people born with Cerebral Palsy is expected to increase, and there is no cure. When I was diagnosed my parents were encouraged to put me in an institution because there was a good chance I'd be "a vegetable" and they shouldn't get their hopes up. I probably wouldn't amount to anything and would need round-the-clock care, anyway. Who knew I would grow up to be a ham instead? And, in a continuing effort to disappoint my diagnosticians, I require no more care than your average fashion-obsessed Diva (okay, maybe just a little more). I'm happy to say that, for the most part, the days of such a dire diagnosis are well behind us. Thanks to advances in medicine and the power of social media there are many new tools that address individual symptoms and tons of resources for parents of children with CP. There are telethons and newsletters and Facebook pages and Twitter hashtags filled with really cute kids that have some form of Cerebral Palsy and parents who want what's best for them in every way. My blog isn't about that. My blog is about what happens to us when we grow up, and grow older, and are no longer cute (okay, I'm still cute; less cute?) and have to make our way through this world. A world that will always be able-bodied-centric, because most people are, more or less, classified as such. A world that doesn't really understand us, but in most cases really wants to include us. A world in which Political Correctness threatens to relegate any questions or observations about the disabled take place in hushed voices, behind our backs, or not at all. A world in which we are all more than our disability - even those that do nothing but whine about their disability. We are, first and foremost, all people; just like you. In that spirit I'd like to answer four questions posed to by my friend Emily Ladau, author of Words I Wheel By, about the writing process of a disability advocate. I'm working on growing this blog into a resource for anyone, especially those who fall within my demographic, who is interested in my narrative about fashion, particularly from my point of view as a curvy, petite, disabled woman over 50. I'm also very intent on presenting what I do within the context of my life as a person of multiple interests and abilities who lives in Nashville, the "it" city of the moment, and happens to have Cerebral Palsy. I'm also working on making Music City more physically and socially accessible for the disabled one event and one building at a time. I'm not sure there are any others of it's genre (although by the time I finish writing this sentence there will be five!). Aside from the whole fashion aspect that is the Spashionista I do the majority of my advocacy in real time on a one-on-one basis. I'm not up on all the latest advocacy language, and I don't consider myself an "activist". 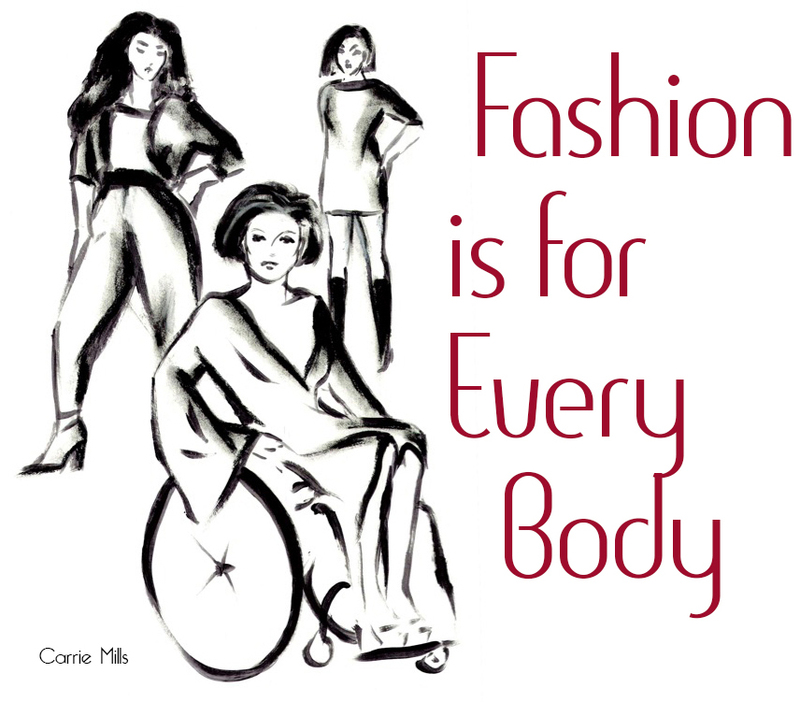 The important thing about what I do isn't the wheelchair in the fashion photo. It's the woman in the wheelchair in the fashion photo at Nashville Fashion Week, or at the new boutique, or even at the movies or the grocery store. It's been my experience that after a while most people stop seeing the wheelchair and just see me, and it's at that point that I have the opportunity to communicate my message to a receptive audience. I do what I do to give other people like me the maximum number of choices and possibilities, and the minimum amount of censorship to our rights as people (and Americans), my words or deeds can afford them. I want to be very clear about that. It means I may very well be advocating to grant access to choices I wouldn't personally make, but anything less is a form of myopic advocacy that ends up hurting my cause in the long run. The world - our world as disabled individuals - needs more choices and options, not less. This personal philosophy makes me very unpopular with just about everyone at some point. I can live with that. Seriously, I've always been able to write. I have a degree in Journalism, and I was the editor of my college newspaper (who's name I can't remember for the life of me!) so I've always taken it for granted. Many years ago I became very disenchanted with how easily a lot of writers I admired began to slant their writing to "steer the stupid", as they called it. It really put me off of writing for many years. Instead I pursued art, cooking, and other interests until the combined effects of my Cerebral Palsy and my age precluded doing much else. My "process" is to schedule appointments and list topics I want to cover on a desk calendar. It's pretty deplorable if you think about it! I know; longest post in the history of this blog. But, I have to add some very sad news. I'm sure you remember my post on Pura Vida Vintage and Only One Tailoring, the wonderful vintage clothing store and alterations shop on Music Row? Two and a half weeks ago I returned to Only One Tailoring with an armful of clothes to be altered, most of which I had bought from Pura Vida Vintage. I was set to return this coming Friday to pick up my garments. But last Monday night changed everything. As you can see, the building was utterly ravaged by fire and water. I'm told my clothes probably survived, but I'm not concerned about them at all. My heart goes out to Krystal Ramos and Aaron McGill. Both have worked so hard to build their businesses and reputation. They are struggling to make sense out of what happened, salvage what they can (not an easy task when your inventory is vintage clothing damaged by smoke, ash, and water) and get back on their feet as soon as possible. The fundraising began last night at Fashion Bash, an event that had already been scheduled and is hosted by the lovely Sunny Fitz, creator of the Sunnyband empire. We'll talk about the event very soon, as well as bring you a visit with Sunny herself. Here are the GoFundMe fundraising links for Pura Vida Vintage and Only One Tailoring. I know you're going to help - and I'll keep posting these until they have what they need.